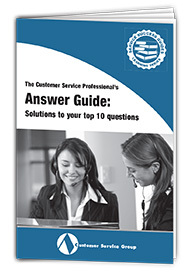 In an engaging Q&A format, the Customer Service Answer Guide provides brief, meaty answers to frontline reps’ most frequently asked questions. Your reps will learn how to bounce back after a nasty call, how to stop stress in its tracks, how to overcome anxiety about selling, and more. Over the years our panel of frontline reps has fielded questions on just about every aspect of customer service. 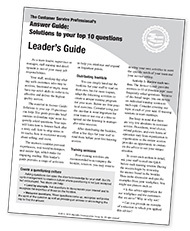 Now, we have gathered answers to 10 of the most frequently asked questions into a practical booklet that should be on every frontline rep’s desk. 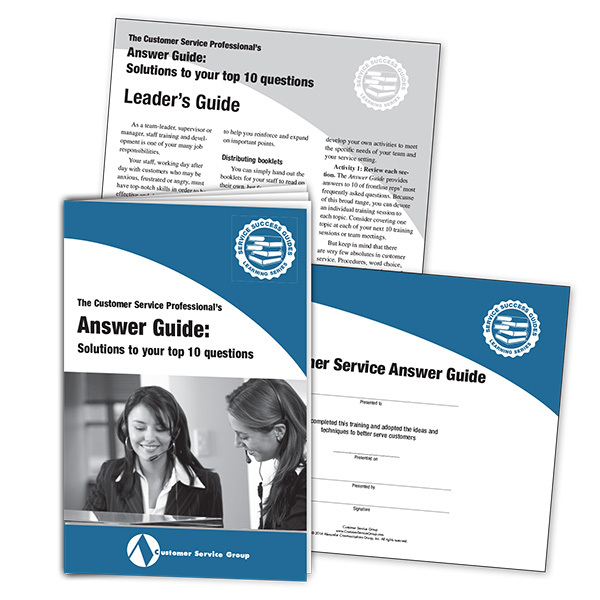 The answers provide a combination of personal experiences, real-world techniques, and insider tips, which make this a useful resource for both the novice and the experienced rep. Question: Complaints are relatively common in our business, and many times customers have a legitimate gripe. What’s the best way to handle customer complaints? Answer: Listen, listen, and listen some more. That’s the best way to handle complaints. Most of the time customers with a complaint simply want to voice their issue and know that it will be resolved. When listening is not enough, however, it’s time to practice your straight A’s: Acknowledge, Apologize, Affirm, Answer, and Act. Acknowledge the customer’s complaint by repeating back what you heard and by asking confirming questions. Both techniques are important in reassuring the customer that you are listening and actively engaged in helping resolve the problem. Answer the customer’s questions and concerns. Address each issue as completely as possible, using straightforward, non-technical language. Act on the information provided by the customer. Whenever possible, offer the customer a choice of options for solving a problem, then take action and do what you’ve committed to. Remind yourself that you are a professional. Organizing healthful break activities such as walking groups. Often, the human resources department is able to provide support for these activities. 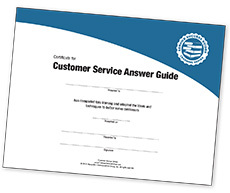 Customer Service Answer Guide is guaranteed. We want you and your reps to use this valuable resource and put its ideas to work in your department. Then, if you are not 100% satisfied, you may return your materials within 30 days for a full refund.